Available only in a limited run of 100 pieces in total; any art paper/canvas, and any size. 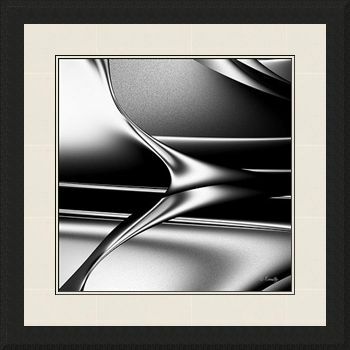 Similar to my other artwork (but not tinted) titled “Sinuosity #1”, the softly yielding curves of the main features, with their diagonal movement and smooth radiant sheen, are offset and complimented by horizontals and diagonals and a background with a rougher textured surface. This unique composition is appealing and unusual. The luscious flow is sensual, seductive and imaginative. The default 2.5″ frame, “Magnificent Matte Black”, has a wide flat surface which steps down to a three quarter inch slope on the outer edge. The mats are two “Blackcore Snowflake” mats, which are a soft gray-white mat with a black bevel and a lightly textured surface. 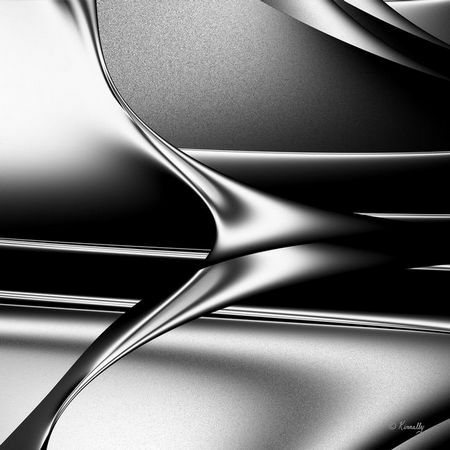 The selected art paper is Epsonâ€™s Premium Luster Photo Paper which produces vivid images and highly saturated prints. The glazing is a UV protection acrylic, which minimizes fading by harmful UV rays. With these framing options the typical finished size is 36″ x 36″, but the artwork can be ordered in sizes from 8″ x 8″ up to 44″ x 44″, not including any framing. Any of these options can be changed, including simply purchasing a print or buying the art on canvas. See a larger image of the artwork Here. ThenÂ click on “Buying Options” (you don’t have to actually purchase to view the frame selections), and you can change the size, art paper or canvas, frame and mat to suit your particular taste, or purchase a print and have your local framer frame it as you desire. Please also visit my Online Gallery to see my other available giclees. This, and other fine art prints by many other artists are available by clicking through to the main site. My supplier only offers the finest giclee print services, with a terrific satisfaction guarantee.